The mother revealed on How I Met your mother! Alas!! The mother is revealed on Mother’s day. The irony of course is quite apparent but the disappoint should not be! As a fan of How I met your mother for now over eight years and eight seasons the validity of mother firstly being revealed on a social networking site and also it being a new person somewhere dilutes my excitement. I wanted it to be a bit contorted some old flame who comes back or Robin turns around and decides to be with Ted. Now you would say that was not possible, as we know in eight seasons through Ted that he met his future wife after Barney and Robin’s wedding. But then he never mentions that they did get married so my guess was always that Robin had a change of heart. I am a die hard fan of Robin and well I seriously thought she had a good chance. i too watch it some times , nice blog you have here. I won’t believe till Ted actually marries the girl. HIMYM’s story changes in such uncharacteristic way that you can not predict even the next shot. Too early to believe it. OH! no After 8 years of suspense finally it is revealed…Thanks for the info….I will watch this next episode..
lolmax ya I know you would definitely watch the next episode.. the tv series Geek that ur! 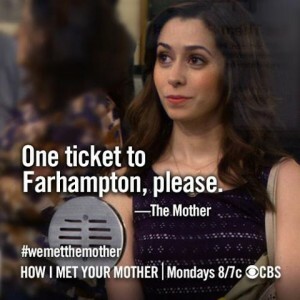 I liked ‘How I Met Your Mother’ initially but then it got boring for me. I found Barney really irritating but I liked Robin. Do you also think she looks like Katrina Kaif?